BAR HARBOR, Maine - As one of the top places to visit in New England, Bar Harbor and Mount Desert Island feature some of the most exceptional and thrilling outdoor activities available. Whether you enjoy testing your abilities on a sheer rock face or executing the perfect downward dog while floating on a lake, Bar Harbor has the terrain to mentally and physically challenge you. Come see what you're capable of. Angling to get more than the traditional tourist experience when visiting Bar Harbor? Deep sea fishing excursions are exhilarating fun for the experienced fisherman. Off the shores of Mount Desert Island you may catch black sea bass mackerel, redfish, and cod, and maybe even a variety of shark or wolf fish. Local charters are available and recommended. By using a guide, you're guaranteeing yourself a safe, memorable and educational trip. Check an item off your bucket list with rock climbing at Acadia National Park. All ability levels are welcome at the park and guides are recommended. Climbers can conquer South Bubble, one of the most popular spots, or test expert level abilities with Great Head, which features an overhang. Equipment rental is also available on the island. Getting bored with your stationary yoga mat? 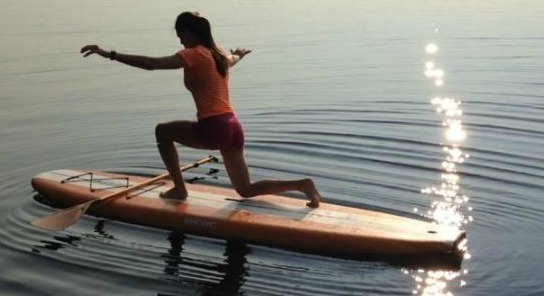 Switch up your routine with a stand-up paddle board yoga session. Classes are offered in the morning and evening several times a week on Echo Lake. All ability levels are welcome and no previous experience is necessary. This session will be harder than most yoga workouts because you'll be engaging muscles that will help you keep your balance on the lake's surface. Getting wet and having fun is all part of this unique yoga class. See the island on two wheels. Acadia National Park has 50+ miles of hard-packed carriage roads looping around the eastern side of Mount Desert Island. One of the most challenging trips is pedaling up Cadillac Mountain, the highest point in Acadia. This is a four-mile auto road and it is recommended to ride during low traffic times. No way to transport your bike? No problem, there are plenty of bike rentals available on the island. Tandem kayaking around Mount Desert Island. Bar Harbor and Mount Desert Island feature some of the best wildlife viewing opportunities on the east coast. While paddling your sea kayak, you may catch a glimpse of seals, porpoises, osprey, and a variety of sea life. All ability levels are welcome and some outfitters give you the choice of having a solo or tandem kayak. Tours range from a couple of hours to full day excursions. For more information on any of these outdoor activities, rental locations, or guides, call (207) 288-5103 or visit www.barharborinfo.com.